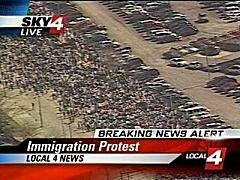 Right now thousands of immigrants are marching through the streets of Detroit headed towards the Federal building. According to WDIV they have closed off Michigan Ave. This entry was posted on March 27, 2006 at 12:06 PM. You can skip to the end and leave a response.